Phillips and Freckleton don't seem to be listed in the early commercial directories but a photographic enthusiast feels that the Nottingham address was only in use from 1899 to about 1901. The only directory entries for Freckleton and Co are found in Nottingham's Wrights 1894-5 and Wrights 1898/9. The address being (1894-5) 69 1/2 Long Row West Market St Nottingham and (1898-9) 63 Long Row West Market St. Bother these addresses are given as also being that of Freckleton and Co while Phillips and Co have a separate Nottingham address. 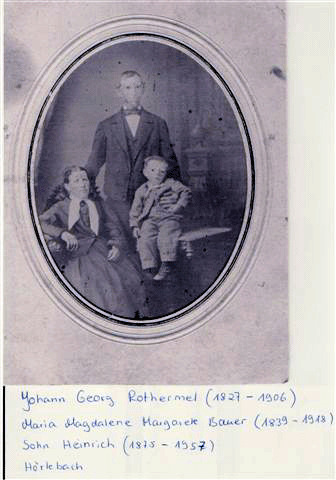 Second son of Johann Georg Rothermel born 08.04.1827 died 22. 04.1906, mother Katharina Barbara Bachmeier born Oberscheffach 25.05.1829 died Hörlebach 30.03.1871. Johann Georg Snr remarried on 22.10.1871 to Magdalene Margarethe Bauer. Perhaps this is why the brothers left home - living with stepmother or to follow many other butchers from the area who settled in England? The Württemberg, Germany Emigration Index was extracted from the original emigration records and translated into English. It contains the names of approximately 60,000 persons who made application at Württemberg to leave Germany from the late eighteenth century to 1900. The information supplied on each person includes: name, date and place of birth, residence at time of application, and application date. The Wüttemberg Emigration Index is an eight volume work that represents the thousands of German and Prussian immigrants to the United States that made application to emigrate at Württemberg, Germany. This collection, filmed at Ludwigsburg, contains the names of approximately 60,000 persons who made application to leave Germany from the late eighteenth century to 1900. The information supplied on each person includes: name, date and place of birth, residence at time of application and application date, and microfilm number. The Württemberg emigration records are a unique collection of papers and documents on applicants who filed for permission to emigrate from Germany during the nineteenth century. These records are not alphabetized nor are the pages numbered, which makes a search through them complicated and time consuming. In many cases, as many as eight pages were written on one person, including a birth certificate or a family record, military release, and renunciation of citizenship rights. Often the handwriting in these documents is almost indecipherable for even an experienced German researcher. It is almost impossible for a layman to search through these records successfully. Emigrants leaving without permission are, of course, not listed at the time of emigration. Yet many of these emigrants, later in life, after having arrived in the land of their destination, sent word back to the Württemberg state and town officials renouncing their citizenship rights. Such repudiation is also documented in the Württemberg emigration records. Our three Rothermel brothers so far have not been found on the index - more research to be carried out. They did however send word back about Frederick's and John George Michael's deaths which are recorded in the local records. John Georg Rothermel came to England after his two brothers and initially he lived with them above the Pork Butchers shop at 12 High Street. Wellingborough Northants. It is said the brothers travelled to Bremen or Rotterdam from Hörlebach and caught the ship to Hull. Tragically youngest brother Martin died in January 1878 of Peritonitis, he was living at no 18 High Street above the Cutlers shop of Frederick Shaw, together with Georg Michael and Naomi. Georg married Ellen Pendred the innkeeper's daughter from next door. Warren Pendred ran the Star Inn. Naomi Rothermel (Shaw) his sister in law was a witness at their wedding. In the 1876 Directory Warren Pendred was listed as the Publican of the Star Inn. A Mrs Pendred was listed as a Beer Retailer in Wood Street Wellingborough. Frederick the youngest brother died in 1878 of Peritonitis. The brothers must have been in contact with their relatives in Hörlebach at this time as Frederick's death was recorded in the German records. In 1898 Warren Pendred was no longer running the Star Inn but appears to have moved to the White Horse in Pebble Lane. Eldest brother John George Michael died in 1899 of cirrhosis of the liver, on the 1901 Census widow Naomi was running the shop with Fritz her eldest son as manager. A baby boy was born to John G and Ellen, Albert George Warren Rothermel in 1893 but died early in 1894.. In the 1906 Kelly's trade directory Joseph John Arthey formerly a farmer and later a farm bailiff of Suffolk had taken over the shop at no 12 High Street Wellingborough.. It was listed right through the war years in the BT telephone directory, his son Frederick Bejamin presumably took over the business as a change of address was listed in 1953 when he presumably retired. Joseph John died in Wellingborough in 1933 aged 80 Frederick Bekjamin died in 1969. In the 1910 Directory Thomas Warren Pendred was listed as a Beer Retailer 153 Knox Road. On the 1901 Census John George, Ellen and family were still in Nottingham, he was working as a butcher, but not a master butcher which means he was an employee. The shop was owned by Eastman's Ltd who had a number of Butchers shops in Nottingham, plus many other branches throughout the country. They were bought out later by Dewhursts..
John George was still listed as a German Subject on the census and the family were listed at 82 Wilford Road very near the station.